a total nod to space balls dark helmet "i see your schwartz is as big as mine, now lets see how you handle it"
For transmog you have vest, Gilet d'Yngwie, and boots, Prototype 2 de S.B.F.A., but no red pants. The only moggable pants in the set are purple, Pantalon raccommodé. 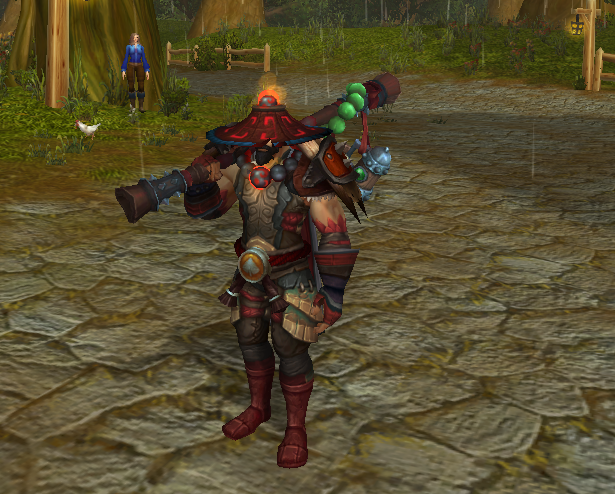 I went after these for transmog purposes for my monk. I started as a Goblin Rogue and just speed quested until I got to the correct quest. It took about 40 minutes to get to them, and the quest was simple. Now my Monk's Transmog is complete.